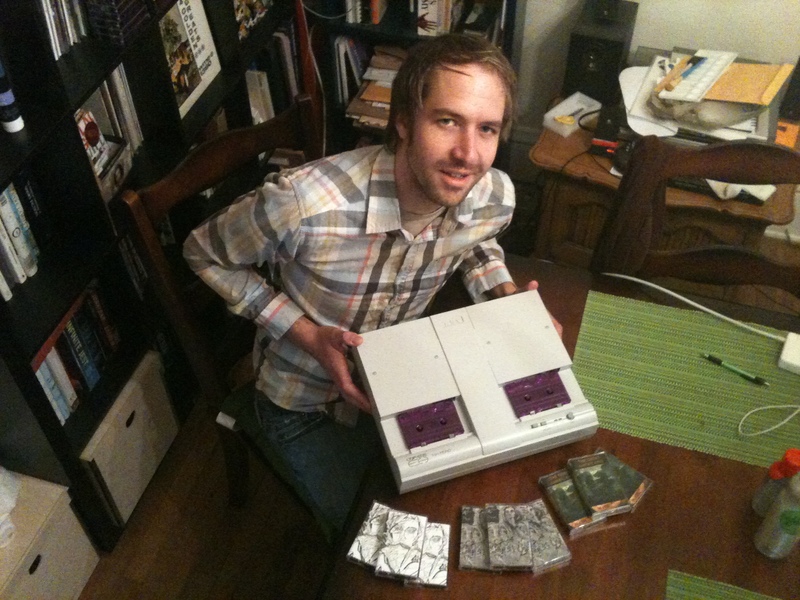 A man and his Telex Copyette: Fresno musician Daniel Schultz of coattrack records. My second freelance radio story for The California Report aired on Friday, Nov. 25. I reported on the unlikely resurgence of cassette tapes in the indie music scene, and I focused on the Fresno-based coattrack records collective as one example of do-it-yourself musicians coming together to share their work with their fans in a simple, cost-effective way via tapes. It was great fun to interview Daniel at the home he shares with his girlfriend, Melissa Olson. (The two collaborate as TeamTeam Creative Effort for multimedia projects, including the FUSE Fest 2011 visual campaign.) Daniel introduced me to his beloved Telex Copyette tape dubbing machine, a contraption he got for free from a friend’s grandfather, a pastor who used it to duplicate recordings of his sermons. The three of us had fun recording all the funky sounds the Copyette made throughout the dubbing process. We also recorded a bunch of sounds that didn’t make it into the final story: tape hiss, unspooling a cassette’s clingy magnetic tape, rewinding the unspooled tape back into the cassette with a pencil, the opening and closing of cassette tape boxes, etc. 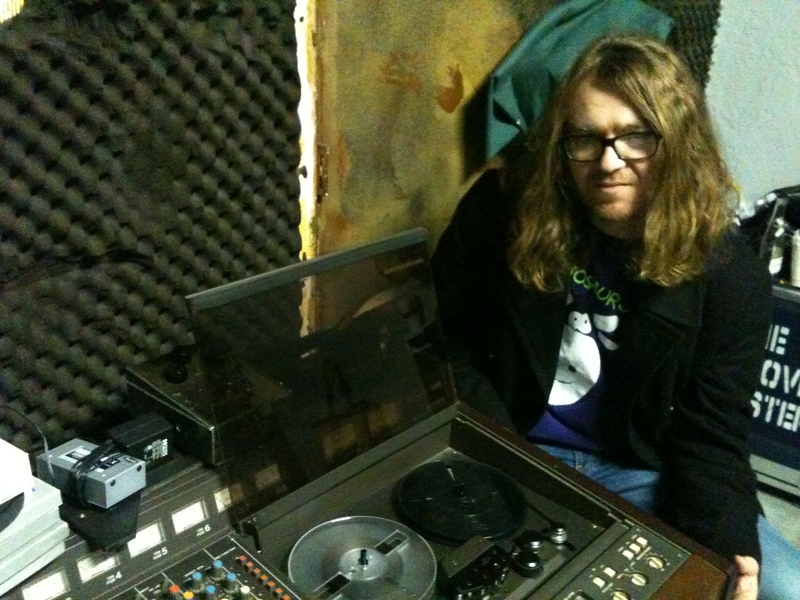 Luke Giffen and his reel-to-reel tape machine. I also interviewed Fresno musician Luke Giffen for the story. His former band, The Sleepover Disaster, released its last album on CD via the now-defunct indie label Devil In The Woods. His current band, The Quiet Americans, released its debut EP, “Medicine,” on cassette via coattrack. I reviewed the EP back in May for Fresno Famous, and I had played tracks from it on my old Evening Eclectic show. But I listened on repeat to “Medicine” on cassette tape in my car during the final week I spent working on this story, and I have to say that I absolutely fell in love with it. The warble and the wobble really intensified as I studied the record on tape, as opposed to the digital versions of the songs I had first gotten to know. Listening to “Medicine” on tape, quite simply, made it better. And that surprised me. My little home recording experiment. The experience of hearing and appreciating “Medicine” in a new way in my car gave me an idea. For the story, instead of using high-quality .WAV files for the music in the piece by The Quiet Americans, Achievement House, and the Fay Wrays, I went old-school instead. I first dusted off my old JVC boombox, which was buried under a pile of fabric in my wife’s craft room. I readied the cassette tape versions of the three albums I was using and carefully fast-forwarded to cue up the songs I wanted. 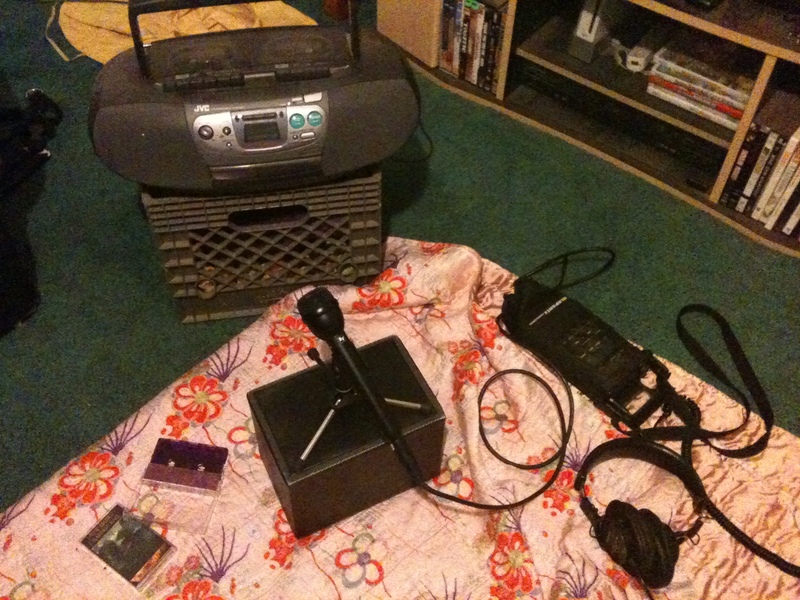 I hooked up my Marantz 660 digital recorder and ElectroVoice RE-50/B omni microphone to capture the sound. And then I played the music out of the boombox, muddy distortion and all, right into the Marantz. The results, as you’ll hear, sounded great. cassette tapes? what will these kids think of next? If you really want to know about the resurgence of tape, you should contact Steve Stepp at the National Audio Company. National Audio Company is the place to go for cassette duplication.